Discounts for weekly stays. Please enquire. Two free adult bikes included. We go the extra effort to make your stay memorable. Fresh linen and towels, hairdryer, herbal soap and eco friendly cleaners. We supply coffee, a range of teas and spices, Olive oil. Enjoy Netflix and a small library/book exchange. The property is located in Mount Maunganui (Omanu), with its own private access to the gorgeous ocean beach. Just down the road is the Omanu surf club, where the children can safely swim between the lifeguard flags. Body boards are provided for your entertainment. Nearby you'll find the Mount Maunganui golf course, where you will enjoy a round of golf in our beautiful BOP summer sunshine. Or go to the nearby Bayfair Shopping Centre, just five minutes drive down the road. Take a leisurely stroll to Georges Cafe just 5 minutes away. There you will also find an Indian Restaurant and Four Square Dairy. Our holiday home has lovely retro features mixed with modern furniture that make it that little bit different. Two bedrooms, one laundry and bathroom downstairs, upstairs lounge, kitchen, and dining room. Features queen bed in master bedroom, a set of bunks and a double bed in the second room, and a single foldout sofa bed in the lounge. Sleeps 7. Off street and covered parking. Out door living areas front and back. We have lived round the Mt Maunganui area for many years and love swimming and body surfing plus walking up the Mt for the wonderful views. We currently live in Whakatane one hour down the coast. Ideally located in the Omanu area of Mt Maunganui which is a little quieter than the beach adjoining the main shopping area of the Mount. We have our own private beach access. Walk along the sand to the Omanu Surf Club, Cafe, Indian Restaurant or Grocery Store Off road parking. Outdoor areas back and front. Very close to Mt Maunganui Golf course. Surf Club, cafe, takeaways, four square five minutes walk. 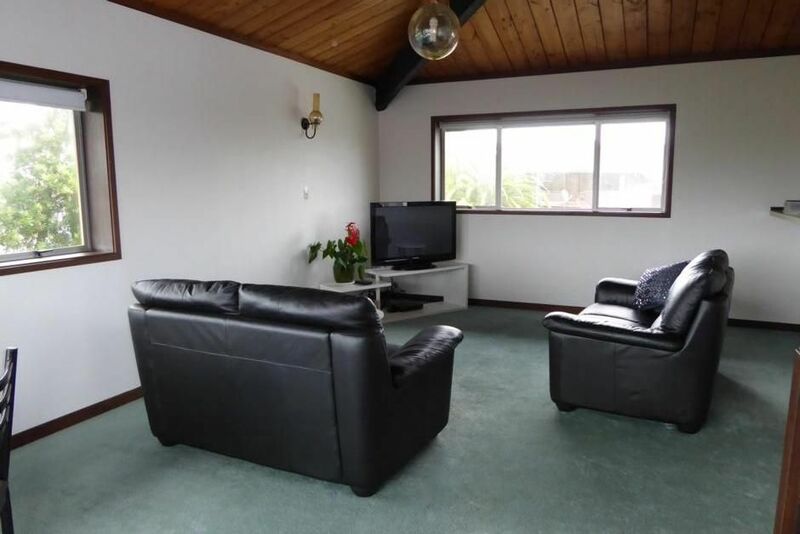 Five minutes by cr to downtown Mt Maunganui or Bayfair Shopping Centre. One kilometre to entrance of Mt Maunganui Gold Course. Opposite the back of the Golf Course. Opposite the back of Mt Maunganui Gold course. One mile to the entrance. Lovely house to stay in and had everything you needed, private access to the beach was great. Once again our stay was a relaxing beach break, the house is very well equipped & we appreciated the extra fans. The access to the beach is great, so we could just grab the body boards & go. We'll definitely keep you on our favourites list for future Mount visits. Clean and tidy, very convenient to the beach, everything we needed thanks! We had a good stay. The house had a well equipped kitchen, bbq and courtyard area and laundry, an ideal setup for families with kids. Climb Mt Maunganui for beautiful views over Mr Maunganui harbour, beach and Tauranga. Scenic walk round the base of Mt Maunganui. Catch the ferry from Mt Maunganui across to Tauranga. Learn to surf at Mt Maunganui beach.